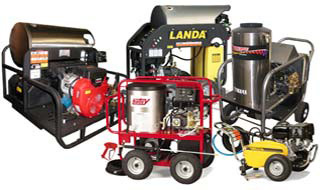 Leasing options provide a way for many small businesses or individuals to acquire the cleaning equipment they need much easier. Leasing is a financing option that removes the upfront cost commonly associated with making an equipment purchase, by allowing you to pay a modest monthly payment instead. If you need a pressure washer, parts washer or mobile cleaning trailer system but don’t have a lot of upfront cash to invest, American Water Works wants to help! We work with a third party – Lease Consultants – to help put the equipment you need in your hands right away. To acquire lease financing is really very easy. You fill out an application through Lease Consultants, and once your credit is approved, we work out the details of payment. Typical leases only require one or two months deposit up front, with approved credit. Unlike a loan where you essentially “rent” money to pay for equipment, leasing means you rent the equipment instead. Plus, there are no interest rates like you have with a loan, and there are tax breaks for leasing. Leasing gives you many of the same benefits of ownership, without the initial cost. Contact American Water Works in Pacoima today to learn more about our Leasing plans. We provide equipment to Los Angeles County, Orange County and Ventura County. Be sure to inquire if we are offering any leasing specials!